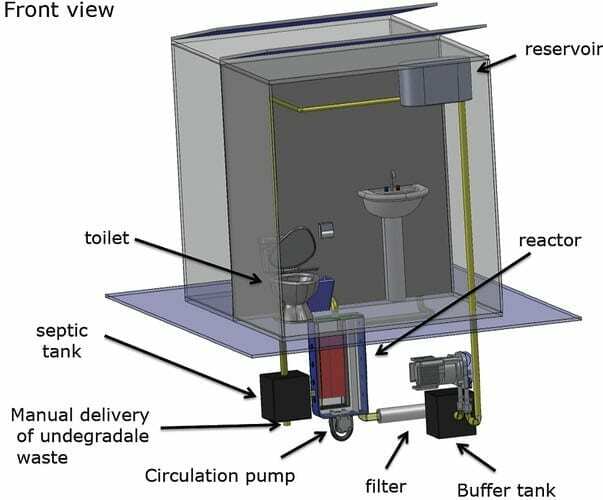 After an extensive search, the Gates Foundation has given millions to this futuristic power-generating toilet from CalTech–with the hope that it can be the solution to sanitation problems around the world. Today is World Toilet Day. That’s not as silly as it sounds. Two and a half million people around the world don’t have access to clean toilets, which means they are at risk for a number of diseases–diarrhoeal diseases, in fact, kill someone every 20 seconds. More people die from poor sanitation than measles, malaria and HIV/AIDS combined. There is some hope. The Bill and Melinda Gates Foundation has been steadily offering grants to sanitation initiatives, including some focused on creating better toilets for the developing world. Caltech won the Gates Foundation’s Reinvent the Toilet Challenge (a call to create cheap, safe ,and hygienic waterless toilets) with a solar-powered, self-cleaning toilet that converts urine and waste into hydrogen and fertilizer. The seeds of Caltech’s toilet were planted 17 years ago when Caltech engineer (and toilet team leader) Michael Hoffmann patented a design for “multilayered nanostructures doing electrochemical degradation,” according to team member Asghar Aryanfar. “He was looking for any kind of application until Bill Gates announced the competition,” says Aryanfar.